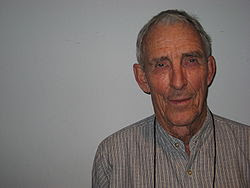 As I was visited recently by Craig Woolheater of the TEXAS BIGFOOT RESEARCH CONSERVANCY, and at the upcoming TEXAS BIGFOOT CONFERENCE, Peter Matthiessen is finally coming out in full public view with the Bigfoot beliefs I always suspected he held, I got to thinking about a book I read over a decade ago, and a certain mysterious creature in it: RUGARU! Back in the mid-to-late 90s I was on a jag of reading "bad history" (the horror, the horror! ), absorbing all I could of the nightmare of humanity's past (trying to awaken). 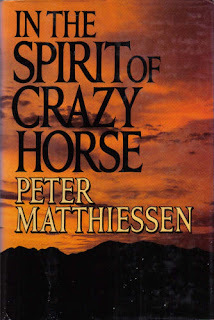 During this time I read Peter Matthiessen's IN THE SPIRIT OF CRAZY HORSE, right after "Bury My Heart at Wounded Knee" and "American Holocaust." As I read along I began to sense something strange about this book. Mostly it is a legalistic recounting of the horrid injustices done to the Lakota, the American Indian Movement, and in particular, Leonard Peltier. But it is also an attempt to tell the history of the People through the aspects of the culture still living and viable in the modern world. A recurrent theme, popping up over and over again, to the point I had to stop, go to the index, and re-read the segments where RUGARU, or THE BIG HAIRY MAN, was discussed. 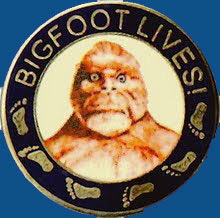 What was Bigfoot-- as the author and his interviewees clearly meant to say this spirit/creature was--doing in this book? Rugaru, just as the Bigfoot we know more familiarly, creeps on the margins, or at the heart of things in this book, as a sub-text that emerges as the main message: Humanity is out of touch, out of balance, crimes against nature and people must be righted, and our ways of life changed to their proper states. See, Bigfoot (or Sasquatch, or Rugaru, or...) isn't some phenomenon originating in 1950s or 1960s popular culture; it has been here for thousands of years, most likely brought over by (or preceding) the Native Americans as they crossed from Asia during the prior Ice Ages. Personally, I learned about Bigfoot in the usual way of my generation, through Leonard Nimoy on "In Search Of," and then through John Green's books in the paranormal section of the public library. I was obsessed, at around the age of nine or ten, with such things, be they ghosts, ESP, cryptid creatures or monsters, UFOs or demons--I was down with it. But in the years interceding my mental use of Bigfoot became increasingly of a humorous nature. It was just simply funny, seen on the cover of The Weekly World News. Bigfoot had the air of something rebellious in it, too: it lived outside of human parameters and society, stank to high heaven, and loved to mess with logging equipment. Bigfoot was the first Earth First-er! Sasquatch was a Rebel. 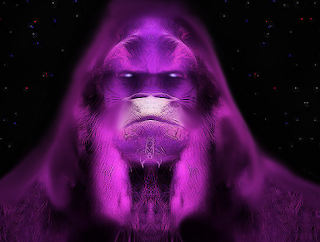 Bigfoot began to appeal to my associates in the ARMCHAIR ANARCHISTS SOCIETY, to the degree that we formed a splinter group, THE CHURCH OF BIGFOOT SCIENTIST. Even as we laughed, joked and chanted "Rugaru, Rugaru!!!" around the campfires, something was slowly changing in me, I was beginning to suspect there WERE perhaps eyes looking back at me from the dark forests, wondering about our absurd behavior and myriad empty beer bottles. And then we encountered something brown and tall, moving through heavy forest brush several miles in to old logging company land way back in the hills above Blue Lake, CA. We only really saw it's head moving quickly through the branches, its body obscured. It could, perhaps, have been an elk; but I've never seen the dogs we had with us respond this way to anything, and they were used to bear, deer, cougars and foxes. They positively freaked out. The thing quickly disappeared down into the deep thickets, but we could hear its treads retreating. There was something strange about it, an unexplainable feeling in the experience. I referred back to Matthiessen's book again, haunted by his evocation of the BIG MAN, the spirit of the woods, of earth's justice, of something beyond current culture and the hegemonic dominance of cheezoid and crass corporate consumerism. As I began reading the books about Sasquatch, eventually consuming about 50 of them, the myth and legend began to become a plausible reality. No, it wasn't just a joke: this thing has been leaving tracks, making appearances, and maybe abducting human females and children, for centuries. The reported characteristics are so consistent that eventually one has to take out Occam's Razor and admit it: the simplest explanation, simpler by far than "myth" and "hoaxing," is that THERE IS SUCH A CREATURE, and it is alive and well out there in the world beyond our imaginations as well as within them. "'Maybe it's a good thing that Nature would come along and change everything, clear all that away, and start again.' Of the Big Man, Joe Eagle Elk said, 'It seems maybe he has got a good heart. He has never hurt nobody. A lot of people over there at Little Eagle, they been shooting at him instead of trying to exchange words and ask why he is coming around. Maybe he is trying to tell us what he wants and where he comes from; maybe he is bringing news for us, a warning.'" So, we should all consider our humanity, humaneness, and the value to be found in the life that surrounds us. That life IS us. Rugaru seems to be here, if not perhaps to warn us in our stupidity, then at least to remind us in our ignorance of the real, wild and largely unknown world that we are a part of, despite many centuries of deluded actions and insane culture. 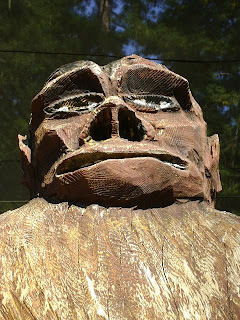 If you want to study this subject further, here is a great article we found in researching this blog entry: "Attitudes Toward Bigfoot in Many Native American Cultures," by Gayle Highpine. "Rugaru," as a neologism or pidgin term is certainly derived from Native interactions with French frontiersmen and traders. The root terms would be "loup" and "garou," meaning basically "wolf-man," "werewolf," or a lycanthropic shapeshifter. 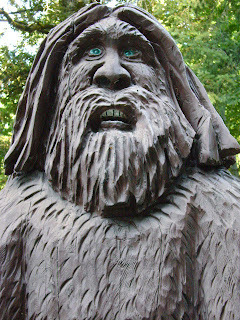 It would seem that this was the French folks' interpretation of the Native's "big hairy man." 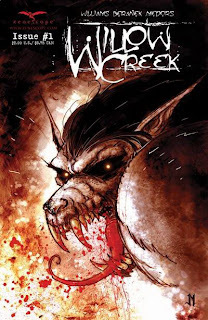 Recently a comic book/graphic novel was produced by Zenoscope Entertainment, called (of all things) WILLOW CREEK, and set here in our area. It involves Bigfoot and a werewolf beast being mixed up between Native and modern culture. A whole group of Bigfoot hunters is slaughtered. The blood and gore flies. Mysteries are revealed. 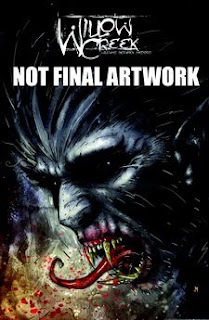 Sadly, production on this cool horror project was suspended indefinitely when the artist contracted spinal cancer. Let's hope he recovers and the series continues. The two back issues are still available at Bigfoot Books, however, while supplies last. Leonard Peltier was recently denied parole, AGAIN. It would seem he is the scapegoat the FBI and government require. Matthiessen's book proves pretty damn conclusively that he is NOT guilty of shooting those federal agents. 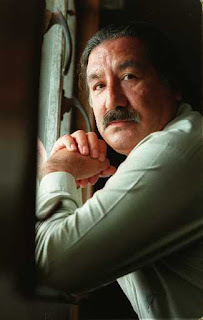 To take action start with the Leonard Peltier Defense Committee. Dad and daughter will be going up to Bluff Creek, Fish Lake, Onion Lake and Onion Mountain Road this weekend. Bigfoot will be found!!! PS--the more I work and live out here the more I hear, from locals and people from the various Native American tribes, about Bigfoot as a shape-shifter, a spiritual, interdimensional being. Before, I'd thought this stuff was kind of nutso. But now I am starting to wonder.... Watch the right side of the blog for a new POLL TOPIC on this matter. Hey Steve, your blog is getting truly inspired. You have found a place to release your copious knowledge and consequent thoughtful insight that has been piling up in that brain of yours. The rest of us are just lucky to get to read it You really are like a Bigfoot clearing house with your ability to take in all the info and organize it, relate and compare it across the board and make it easier for the rest of us to get the picture. Thanks! I predict more accolades for you in the future. Proud to have you as a friend. Gee, me humble thanks. Bigfoot think me come eat all food in yur house kitchen then beer all drink. Although I've never seen a Bigfoot, I did want to comment on the general sense of the lower Klamath River valley I got while driving from Happy Camp to Willow Creek 7-3-2012. As a technician with a large service territory in Oregon, I occasionally get into the Happy Camp area. However, on this day I had an assignment in the Willow Creek area which made my route take me down Hwy 96 through the small settlements and the bigger town of Hoopa. Driving along this very remote part of Northern California I was taken by the depth of the river valley itself...the mountain walls seemed to rise right out of the river to great heights...maybe 5 to 6 thousand feet or more in places. But in driving the length of the valley, one eeiry, heavy sense pervaded me.......this place is haunted. I could feel it the entire 80 miles of its length. My very dependable intuition told me of a heavy oppressivness I felt from Happy Camp to Willow Creek. My senses told me it was strongest in Weichpec, but in Hoopa my intuition told me to get out of here. I'm not native American so I probably didn't belong there, but this feeling was something else...like an actual spirit haunting of that long valley. When I left Happy Camp going back over Greyback Mountain and back into Oregon the oppressive feeling left me. After that experience I know one thing for sure -- I would never drive Hwy 96 at night under any circumstances. It is one scary place to be. Anonymous, July 11th... I KNOW WHAT YOU MEAN! But for me it is that same feeling that makes the place mysterious and magical, and I think it accounts for many of the "Bigfooty" feelings people have out there. Maybe it has something to do with the presence of Bigfoot creatures in the area, maybe it is just the mysterious majesty of the convoluted landscape? In any case, there is a lot of this old kind of "black magic" done out there in the hills by the natives, including the legend of the "Injun Devil." The more one looks the more mysterious it gets. However, I have never once been truly spooked nor harmed. There is, indeed, though, what we call the "Curse of Bluff Creek," which normally amounts to flat tires and rocks through engine oil pans. I just started reading Matthieson's book this morning and started researching the Brown Man as soon as I got through the intro. I knew there was a connection and wanted to see if there was any more info about it - your site was the first that came up. Glad I'm not imagining the connections. 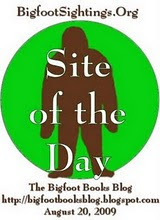 To be honest, I viewed Big Foot stories with a bit of skepticism, until I read Matthieson.